A few Sundays ago, during one of those but-it's-late-spring-FFS-Melbourne cold snaps we were getting on the weekends, I caught up with Schatzi and her beautiful son. 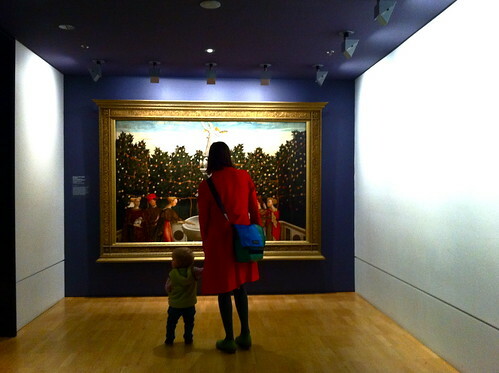 We'd earmarked the weekend months ago: our original intention had been to go away together for the whole weekend to Queensland, which was then whittled down to a day in Daylesford, and then to an afternoon's Devonshire tea in the Dandenongs, then finally down to a few hours at the NGV. You know how it is - life tends to get in the way. 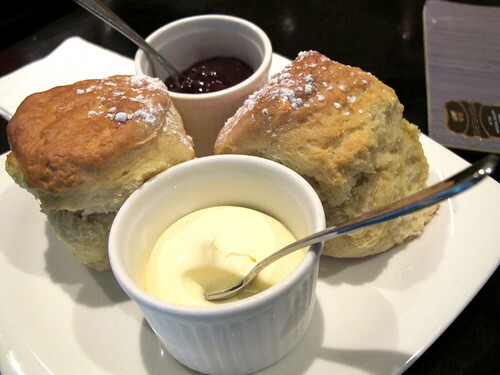 Luckily, we could still get our Devonshire tea fix at The Tea Room. 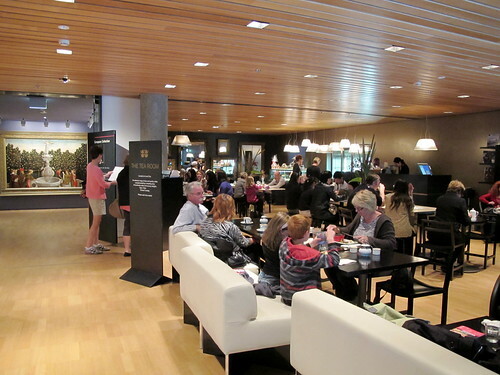 The Tea Room is located up on the first floor of the NGV, just to the side of the water wall. 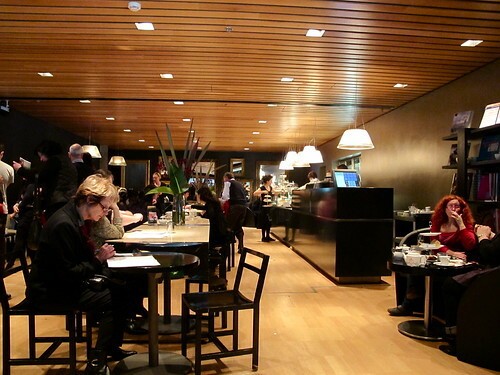 As the name suggests, there are over a dozen varieties of tea to choose from (I tried a delicate Bai Mu Dan, or Chinese white peony tea), as well as a range of sandwiches, salads, quiches and handmade cakes and pastries. A selection of afternoon tea (with or without Deloraine Chandon Vintage Brut) can be served for two on a high tea cake stand. 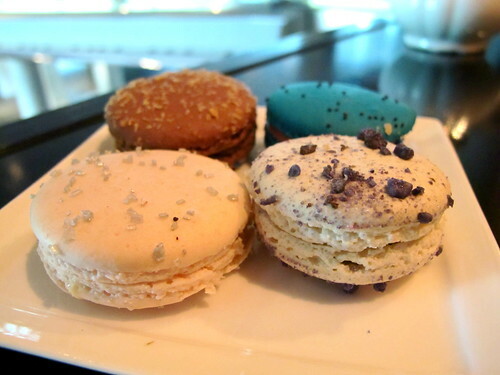 I was interested to try the macarons by Mauritian-French chef Selvana Chelvanaigum, as two Melbourne Gastronome readers had highly recommended them when I wrote my post about the best macarons in Melbourne. Selvana's macarons ($2.50 each, from memory) lived up to expectations: creative flavours, excellent textures, no air pockets. There were lots of different ones to choose from, but we tried the rosewater, the violet, the lamington and the (lurid) blueberry. My mother's formidable baking prowess means I've always been fussy with my scones, but The Tea Room got them just right: freshly baked, light, slightly fluffy, not at all chalky ($9.50 with cream and jam). I wish they wouldn't sprinkle sugar on them though. Even if you're not going in to the gallery itself, The Tea Room is a nice place to cosy up on an armchair and while away an afternoon. Next time you're in the 'hood, scoff a macaron then run around like a mad thing under Leonard French's stained glass ceiling, like we did. 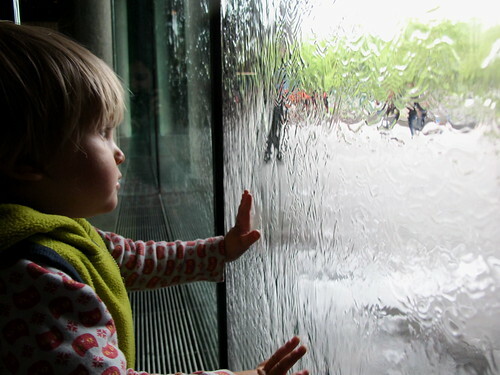 Someone fell in love with the water wall! that little someone is gorgeous....love the big shot with the stained glass background! great post.... that giant rabbit was up her in bris last exhib...i though i recognised him! Having afternoon tea at the tea room is not too bad. It's reasonable and affordable for most students. :D More importantly, the food is decent. 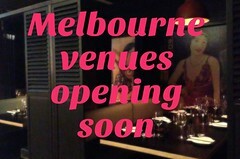 I didn't realise there was a restaurant/cafe at the NGV! Will definitely go and try- thanks for sharing :). 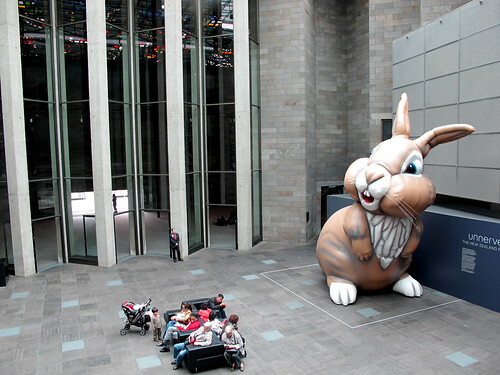 I always forget to visit the NGV but will have to now, just to see the giant rabbit. And to have a nice afternoon tea, of course. Gorgeous shots of the little man! Right, that's it. I've decided what I want for Christmas now - that enormous rabbit. I feel flattered that you should so describe my baking prowess. I'm a bit of a fraud really and could not produce the stunning macarons or cupcakes that certain friends of yours seem able to whip up. 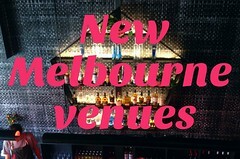 But I'll accept from you the moniker Melbourne Gastromum. My surrogate grandson grows more gorgeous by the day! thanks for the tip, those macarons look ace! 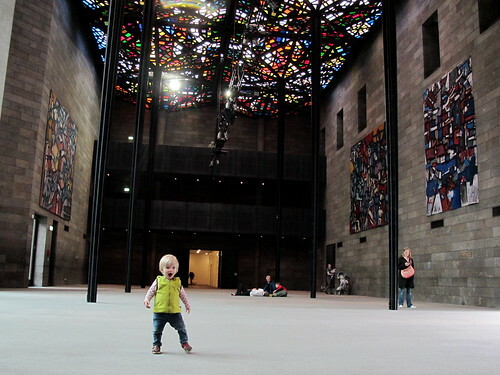 I'd never think to go to the NGV just for afternoon tea.. what a great idea! 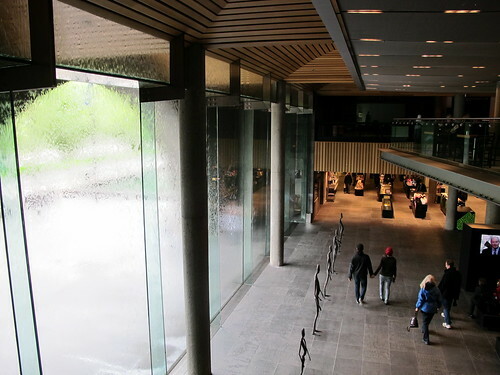 I always used to love that water wall when I was a child. I haven't been there for ages! Thank you to all of you for your comments... that little man is very photogenic!